Many thanks to Lisa Withers, M.A. student at UNCG and Blandwood docent, for this guest post. Artifacts in a house museum help visitors gain a better understanding of daily life for the individuals and families who once occupied the dwelling. One popular item is the rope bed found in many early American homes which helps visitor compare how Americans in the 18th and 19th centuries slept in contrast to the beds we use today. 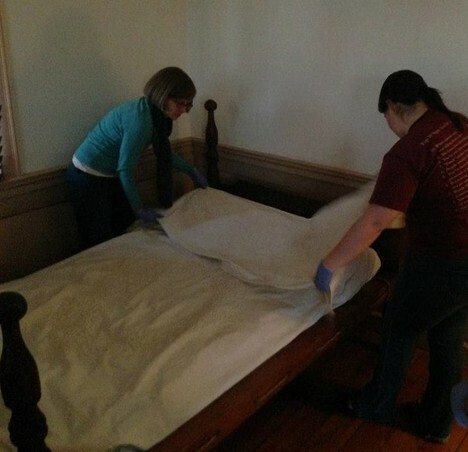 Earlier this year, a group of museum professionals gathered at Governor Morehead’s Blandwood Mansion to re-string the rope bed located in the 1795 section of the home. Marian Inabinett and Corinne Midgett of the High Point Museum joined me and Elyse Bennett, also a UNCG museum studies student and Blandwood docent, to get the job done. While preparing, our group found a great tutorial video made by David Sextner and Jerome Bias at Hope Plantation, which helped us understand the process . To get started, we removed the old rope from the bed frame. At the top of the bed, we pulled the length of the new rope through the length of the bed in a similar manner as pulling thread through the eye of a needle. At the head of the bed, we made a knot on the side of the frame facing the wall. 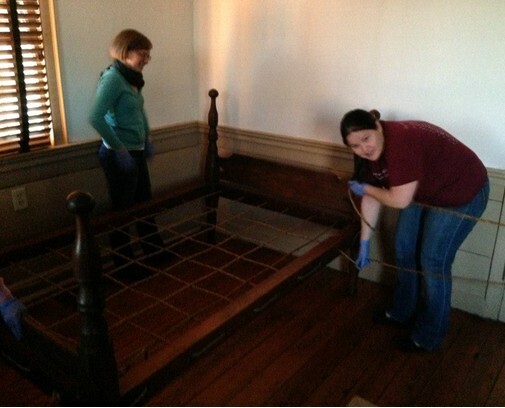 We continued threading the rope in alternating directions the length of the bed. When the bed was re-strung lengthwise, we wrapped the rope around the corner of the bed frame to change directions and began re-stringing across the bed’s width. We interwove the rope going across the bed’s width with the rope along the length of the bedframe, alternating direction each time we went across the width of the bed. As we interweaved the rope, we gently pulled and tightened as we went along to keep the appropriate tension on the rope and frame. When we reached the end of the bed, we made another knot on the bedframe’s exterior. We then checked the tension of the rope to ensure it was tight enough to keep the bed frame in place and to provide extra stability. When we finished re-stringing the bed, we covered the ropes with an interwoven oak pallet, a tick pallet, a pillow, and a coverlet. From our experience, we found it was beneficial to have a four-person team with two individuals to hold frame stable and two to restring the bed. For a 6 ft. 3 in. by 4 ft. 3 in. bed, we used approximately 100 ft. of 3/8 inch twisted manila rope. From the procedure of re-stringing a rope bed, it is easy to see how the origins of the phrase “sleep tight” became a popular myth. However, the phrase is rather modern, as the Oxford English Dictionary lists its first use in 1933. While there are a few earlier written accounts using the term, there is not sufficient evidence to suggest the phrase came from the practice of stringing a rope bed. 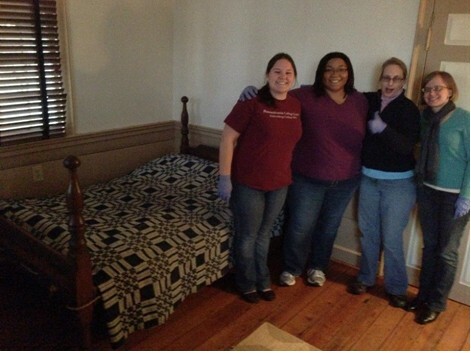 Photos courtesy Benjamin Briggs, Executive Director of Preservation Greensboro, Inc. In honor of May as Preservation Month, this post is about a preservation issue inside a building that is iconic for all of North Carolina as well as its capital city. 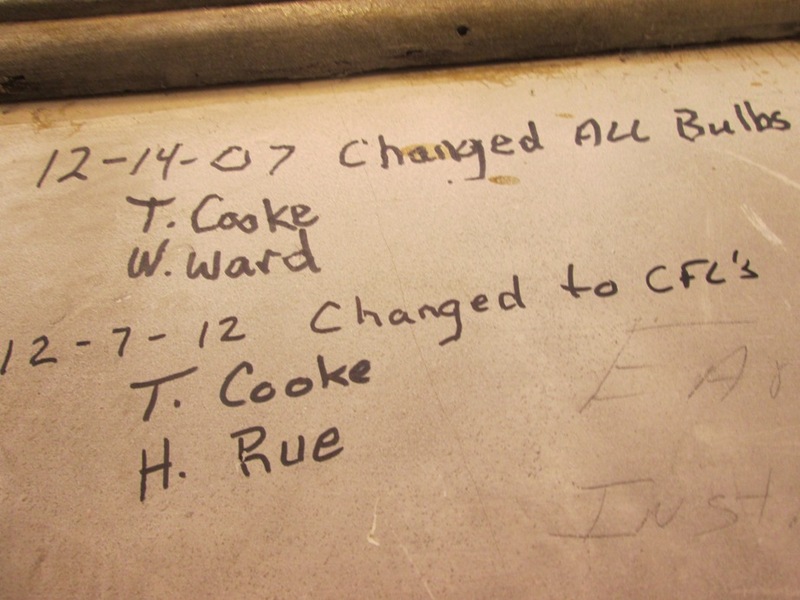 Since its completion in 1840 many visitors to the Old State Capitol Building in Raleigh have left their marks. The large hand-cut stone blocks bear the chisel indentations of various stone cutters; the worn stone steps attest to many footfalls and heavy loads dragged upwards; and wooden banisters in the house and senate chambers boast carvings of names/ initials and dates. Is it a sense of the structure’s significance that has compelled some of those passing through to carve their names into the wood? These marks of creation, use, and commemoration (however subversive) are visible to all who visit the Old Sate Capitol for one of its free tours. Recently I took advantage of an opportunity for NC Department of Cultural Resources staff to take a behind-the-scenes tour of the building. We snuck peeks at staff offices, attic storage areas, and views near the rotunda. 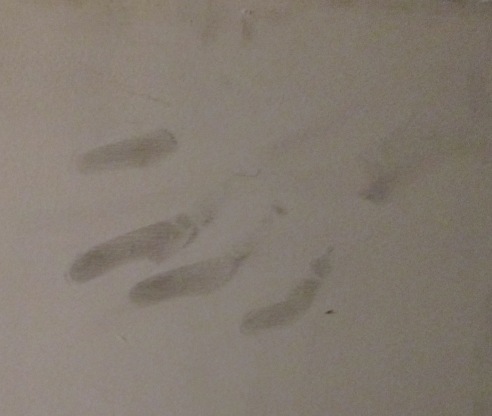 The marks individuals had left behind continued, and perhaps became even more pronounced, as we climbed and pressed our way into non-public areas. 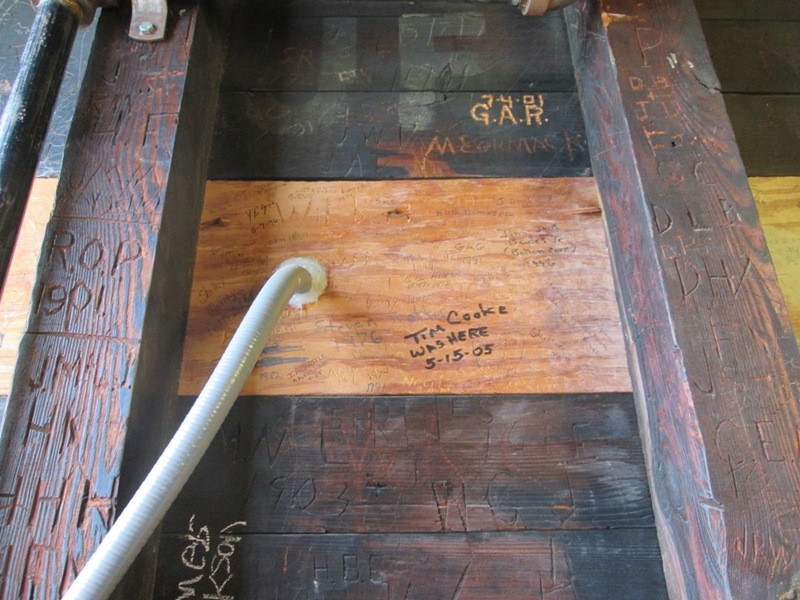 This wall (left) near a roof access door exhibits over a hundred years’ worth of visitors proclaiming “I was here!” Earlier marks from the 1900s or so have been carved into the wood, whereas modern graffiti artists chose markers to commemorate their visits. 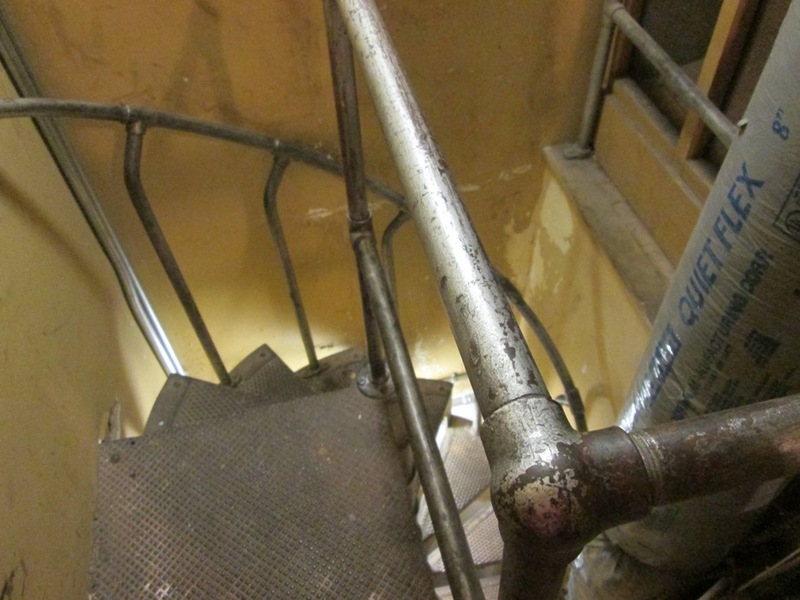 Additionally, several of the more hidden corridors bear the marks of hands which have accomplished the difficult and often dangerous work of building maintenance duties. These marks on the right are from electricians who have squeezed into tight spaces and balanced themselves on ledges to change light bulbs around the senate chamber rotunda. When do preservationists view marks like fingerprints and graffiti as defacement in need of correction and when do we view them as interesting testaments to a building’s (or object’s) use and significance? This is a question object conservators must ask themselves before each treatment, and sometimes the answer is different. Cleaning is irreversible and permanently strips away evidence of human interaction with the material. The Old State Capital staff has taken two different approaches to this quandary. For some of the wooden railings bearing carved letters and numbers from visitors (dating from the building’s period of use, 1840-1963), the marks remain. For others, staff has in-filled the carvings and painted over the rails. Which approach (or combination) has your site taken? Thanks to Martha Battle Jackson, Chief Curator of N.C. Historic Sites, CREST member, and C2C instructor extraordinaire, for this guest post. BTW: In the book link, there are some other rather intriguing projects listed on the right side, including “Belly Button Biodiversity” and “Armpit Life”. Can’t say these folks don’t have a sense of humor! Cedar mulch – years ago, I did a project with Eleanor’s major professor where we found that ants did not like to set up nests when the area was covered with cedar mulch. However, as those volatile cedar-smelling chemicals are depleted, the ants will move into the area. As for termites, [they] will inevitably get into any wood mulch and reduce it to organic waste. The big thing is that I would not let it touch the building. We recommend keep mulch 6-12″ away for several reasons (including mice). In the bigger picture, you’re better off with gravel closest to the building, although that gets very expensive. The good news for Duke Homestead was that Waldvogel did not find evidence of termites in the building. There were some in a log about 10 ft. away, and staff has since removed it. If your NC institution has questionable pest activity, contact the NCSU entymology department, as Martha and Jennifer did. The experts there can identify pests and offer advice if you provide them with good images. Tags: Duke Homestead, Integrated Pest Management, Martha Battle Jackson, NCSU Entymology Dept.